Winter showers strafed Flemington today. And snow on the alps. It reminded me that my season is now over. I’m a fair weather punter. I started out well with Calcatta, improved with La Tikka Rosa at $4.10 the place, gave some back on Dash for Viz, and came steaming home on Fulgur. I still can’t believe Fulgur was $1.30 the place with the books and $1.80 on the tote. Three out of four. Nice to go out with a bang. I’m off to the paddock now. Hopefully back in the spring, late September at the latest, but definitely for the Caulfield Guineas. Look out for a postcard from the paddock. It might be Mother’s Day, but today, Sunday the 12th of May, is my Father’s 101st birthday. Born in the year the Titanic went down. He has been gone a long time now, some 29 years. Time seems to be speeding up. I had a very interesting conversation yesterday with Joe Agresta, the track rider for the maestro, Bart Cummings. I had two questions, which have been bugging me for ages, now that I’m paying more attention to the bridle. 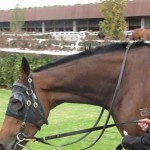 Firstly, did Saintly have a Norton bit, and secondly, is the Cummings bridle a bit lifter? The answers are yes and yes. 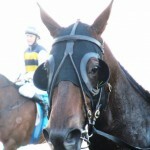 Saintly was a hard pulling horse. “He’d pull the arse off you”. This was a shock to me as my memory of the horse lobbing around the yard is one of relaxation. All sweetness and light. Maybe, a Jekyll and Hyde horse. Once the jockey was up he got all fired up. And if you have a close look at the Cummings bridle it has to be classified as a bit lifter, but is never recorded as such in the gear list. I guess Bart being Bart he gets special dispensation! It’s a poor photo of Rosscarbery, but decide for yourself. Only one bet as I was feeling a bit poorly and was pre-occupied with spreading a virus around all day, but Serene Star did the job in the last. Two interesting twitches, in birdwatching lingo, today. First, the double gear combo on Felidea of a Norton bit and cross-over noseband. Straps all over the place. It looks pretty severe and indicates a pretty strong pulling horse. The sort of horse that I dismiss straightaway. But it obviously did the job as the horse flew home to win by a whisker. And I always thought the verb “to hog” meant to avail oneself greedily of all the party pies on offer to the detriment of all other party goers. But it also means to cut a horse’s mane short. There was a nice hogged mane on show today by Fiddle Dee Duddle, which reminded me of images of the Trojan war horse. 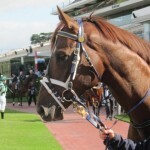 The horse is a recent arrival in the Hayes stable from Perth, and apparently it is a more common practice over there. Maybe it’s something to do with the heat. The streamlined look didn’t help the horse in the run home and it finished tailed off last. Maybe it had a cold neck.